Oliver Stone's feature film debut is a wicked little horror movie that predicted the home terror films of later eras. The main draw to check out the new Blu Ray release of 1974’s Seizure is the fact that this semi-surreal horror film happens to be the directorial debut of Academy Award Winning A-List director Oliver Stone. This fact may be even more noteworthy because Stone’s second film, The Hand (1981) was also a weird horror movie (imagine “Thing” from The Addams Family as a legitimate diabolical threat), his third film, Salvador (1986), was a complete box office flop and his fourth film, Platoon (also 1986) won seven of the eleven Oscars it was nominated for, including Best Picture and Best Director. This is partly because Seizure is, on one hand, a relatively standard and often predictable low budget '70s horror film with not a lot to help it stand out in the crowded field of its peers. On the other hand, Stone’s first feature is a remarkably sadistic and often disturbing little film which predicted such later home terror flicks like The Strangers (2008) and Funny Games (1997), as well as the 2007 remake of the latter. Seizure centers around a famous horror writer named Edmund Blackstone. If his career doesn’t make him noteworthy in his creepiness alone, then the fact that he is played by Jonathan Frid (the Vampire Barnabas Collins from TV’s Dark Shadows) should complete the bill for you. Blackstone has moved, along with his wife and his son, to a huge, somewhat gothic lakeside cottage in the country so that he can continue his horror fiction. Blackstone could be bounded in a nutshell, and count himself a king of infinite space, were it not that he has bad dreams. The author’s nightmares include a trio of evil and bloodthirsty beings led by “The Queen of Evil” (Martine Beswick) and rounded out by a dwarf called “Spider” (Hervé Villechaize) and a monstrous and disfigured executioner called “Jackal” (Henry Judd Baker). Believing that these are only dreams, Blackstone invites a large group of his friends (including the familiar faces of Mary Woronov, Troy Donahue and Richard Cox) to his country abode for the weekend. Then, as you can guess, the evil trio arrives uninvited and begins to entrap and murder his family and friends with the intent of leaving only one alive. In short, they aren’t terribly nice people or gracious houseguests. Stone does a fine job of keeping the mysteries of the story firmly in the realm of the unknown. Are any of these apparitions real aberrations or still a product of Blackstone’s nightmare-tortured mind? Could Blackstone be the only one who sees them and could the early horrors be his own insane doing? At first the audience is kept completely in the dark, but around the mid-point of the film everything becomes both apparent and even obvious. The fact that Seizure is rated PG illustrates that, even for the time (when such films as the viscerally terrifying The Legend of Hell House received a PG rating), there would be somewhat minimal sexuality, gore and violence (as compared to, say, the previous year’s The Exorcist). However, much like Hell House, Seizure is disturbing on a deeper, more primal level. That said, the blood that does taint the screen is pretty damned disturbing. Stone was experimental in his first film and that potential helped to lead directly to his later Hollywood successes. Here, many of the experiments do work, while others fall flat and feel predictable and silly. Even for the time, the “surprise twist ending”, though twisted, is not much of a surprise to the attentive viewer. In spite of this, although not too much causes Seizure to shine against the backdrop of its contemporary competitors, there is also very little in this film that makes Seizure look worse than its peers. Stone’s experiment is executed as professionally as similar films of the day, like Blood Mania (1970), Let’s Scare Jessica to Death (1971), Dead of Night (1974) or Virgin Witch (1972). Seizure is well lit, usually well acted, and professionally recorded for a quality sound mix. The 2014 Scorpion Releasing Blu Ray features a very fine transfer of the film itself with quality sound. However, the occasional blemish and scratch continues to mark and mar the odd frame. This is, of course, taking into consideration that Stone intentionally left (or inserted) some grindhouse-style film scratches in some of the more chilling and fast-paced horror moments to enhance the discomposure of these scenes. Further, Seizure is one of a breed of post-Hammer style films that celebrates the lavishness of gothic horror with natural darkness. This tends to make Seizure look very dated compared to today’s films (especially those by Stone), but Scorpion was wise enough to leave out the digital enhancement and to preserve the original film as it is. Extras on the Blu-ray include the original trailer as well as a very telling interview with vixen Mary Woronov, followed by a similar talk with Richard Cox. Woronov’s sharp-tongued interview is blunt about every cast and crew member (including Stone) and goes into detail about her other films (many of which she is critical of, including those filmed by her ex-husband Theodore Gershuny). Cox also goes into greater detail about his career at large and seems to be completely incredulous at the fact that many of the movies he is least proud of are now being released on Blu-ray. The extras do provide a great deal of information (not to mention a few laughs) and the theatrical trailer is welcome, but it’s hard for fans of the film (and Stone’s career in general) to not hope for a bit more in the Bonus Features area. Still, with the trend leaning toward bare bones releases lately, Scorpion should be congratulated for what they include. 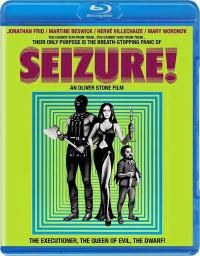 As for Seizure itself, its main notoriety continues to be the fact that it was Oliver Stone’s first film (based on his original concept and co-written with Edward Mann). There are moments of potential and even flickers of brilliance in this brutal little movie, but in the overall final analysis Seizure is merely a “pretty good” time passer. Without the curiosity of Stone’s involvement it’s hard to imagine this film being considered much of a classic.